The Hungry Man is a short body-horror story written by Anthony Wilbourne under the pseudonym of Justin Ryan. It's told primarily in first-person by the protagonist, recounting the circumstances surrounding his friend's demise and own near-death. The book's split into two disproportionate chapters: After and Before. The former relays the dialogue of a local TV news segment that took place immediately after the incident, and the latter depicts the protagonist, whom the author never identifies, telling the reader his story as if interviewed by somebody inquisitive. The book's approximately 10,000 words and available in ebook, audiobook, CD and paperback forms. The Hungry Man is the first story to take place in Wilbourne's fictitious locale of Wessex County, USA    . The protagonist, a 30-something-year-old man with a lust for younger adult men, has just finished inspecting a new apartment somewhere in West Wessex. He--who's also the book's narrator--describes the neighborhood as "bright, pristine" and having an " anachronistic charm." After completing the rental application and submitting a security deposit, he returns home to discover that his fiancée is pregnant. He takes the news poorly, argues with her and leaves his current residence. He meanders downtown before meeting an attractive, nomadic male trick near an old trail behind a local community college. Upon reaching his and the trick's hideaway, the protagonist discovers a mutilated but able-bodied cannibal, whom he frequently calls "the beast", devouring his friend. He tries to help him by throwing a rock at the madman but only provokes him to pursue a new target. The frightened protagonist runs into the light-deprived woods where "the trees grew taller, the rocks and bushes looked bigger, and the sky seemed smaller." The chase ends with the accidental death of a male cruiser. The protagonist, having recently reported the murders, returns to the college with a couple police officers. The beast deceives the officers and attempts to devour the protagonist. The protagonist cleverly incapacitates and shoots the beast dead...or so he thought. The story ends with an epilogue detailing a criminal trial against the protagonist, the media's departure from the case, the public's fascination with the event and everybody's disregard for the protagonist's dear friend and lover, the trick . "The Hungry Man" was rejected by two literary magazines, Tor and Sanitarium, before Wilbourne chose to distribute it via Amazon. The editors basically told him that, although the story showed promise, it wasn't quite right for their magazines." The short story was published as a Kindle ebook by 1613 Productions, LLC on April 14, 2015 . Currently, it holds a 3.75 out of 5 star average rating on Goodreads , a 5 out of 5 on Audible  and a 2 out of 5 on Amazon Canada . No sales records are available at this time. "The Hungry Man" is sprinkled with nods to earlier movies, songs and characters. In paragraph eight of the Before chapter, the protagonist makes a reference to the song "Steal My Sunshine" by Len. In paragraph forty (of Before), while describing his chase with the beast, he ridicules the women in horror films that'd usually trip and fall in similar situations. In paragraph thirty-five, he paraphrases a line from the animated movie " How the Grinch Stole Christmas." The book also contains social commentary, criticizing mainstream media, corporations and the judiciary. The news report in the After chapter possesses a rushed, sensationalist style arguably characteristic to Fox, MSNBC and other such networks. In paragraph eleven of Before, the protagonist describes his employer's business practices as being similar to those of Walmart's. Towards the end of the book, he alludes to a police force that is occasionally incompetent and a justice system that's quick to unfairly prosecute than fairly investigate. "The Hungry Man" also touches on matters of addiction, monogamy, sexual confusion and socioeconomic inequality . Essentially, it's supposed to be "a literary homage to classic horror movies with the protagonist's--or victim's--gender flipped and the killer's sexuality ambiguous", expanding "the landscape of horror, mystery and thrillers" . ↑ 1.0 1.1 1.2 1.3 Ryan, Justin. The Hungry Man. 9th ed., 1613 Productions, 2015. Kindle. ↑ Ryan, Justin. The Hungry Man. Narrated by Arthur Grey et al., 1613 Productions, 2017. Audiobook. ↑ Ryan, Justin. The Hungry Man. 1613 Productions, 2017. ↑ "Various Artists - The Hungry Man - Amazon.com Music." 18 Mar. 2019, amazon.com/dp/B075Y8DHLS. ↑ Tor.com Submissions Staff. "Re: SUB: The Hungry Man by Justin Ryan - A Short Horror Story" Received by Anthony Wilbourne. 29 Mar. 2015. ↑ Skelhorn, Barry. "[S] Thank you for Submitting to Sanitarium Magazine‏." Received by Anthony Wilbourne. 7 Apr. 2015. ↑ "The Hungry Man: A New Breed of Horror Short Story by Justin Ryan." Goodreads, 18 Mar. 2019, goodreads.com/book/show/25368574-the-hungry-man. ↑ "The Hungry Man (Audiobook) by Justin Ryan | Audible.com." 18 Mar. 2019, audible.com/pd/Fiction/The-Hungry-Man-Audiobook/B06XXQ45PQ. 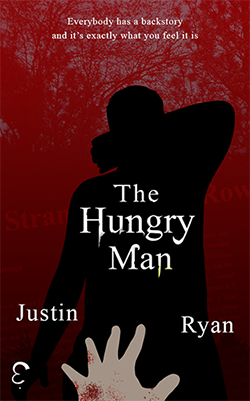 ↑ "The Hungry Man: A New Breed of Horror Story eBook: Justin Ryan, Anthony Wilbourne: Amazon.ca: Kindle Store." 18 Mar. 2019, amazon.ca/dp/B00W671DGU. ↑ 10.0 10.1 "The Hungry Man: A New Breed of Horror Story - Kindle edition by Justin Ryan, Anthony Wilbourne. Literature & Fiction Kindle eBooks @ Amazon.com." 18 Mar. 2019, amazon.com/dp/B00W671DGU. This page was last modified on 1 April 2019, at 01:48.